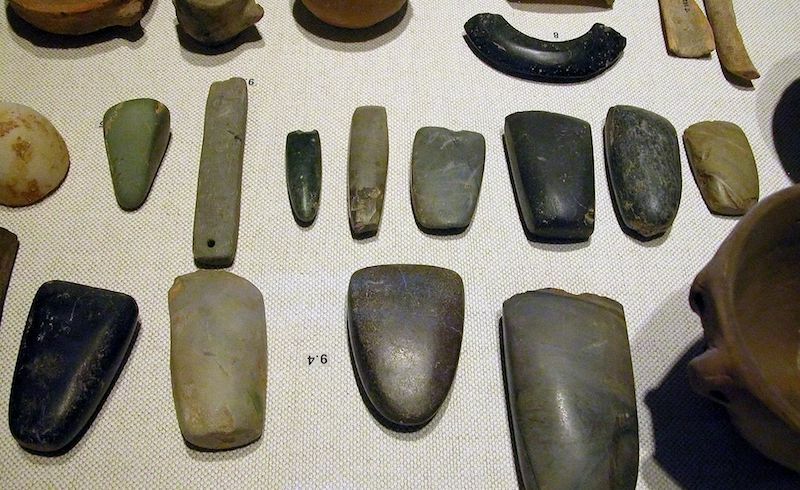 Display of Neolithic artifacts. Photo: Michael Greenhalgh. via Wikimedia Commons. Today, it has become commonplace to predict the end of the human race such as we know it. There are various reasons for such forecasts. According to a messianic kind of environmentalism, the excessive predations of a beastly humanity will soon bring about the end of life on Earth. Meanwhile, those who instead point to runaway technological advances prophesy, indiscriminately, the automation of all work by robots, grand developments in computing, automatically-generated art, plastic-coated killers, and the dangers of a super-human intelligence. Suddenly, we see the emergence of threatening categories like transhumanism and the post-human — or, their mirror image, a return to our animal state — depending on whether one prophesies on the basis of technological innovation or laments all the attacks on Mother Nature. For me, all such prophesies are just so much ideological noise, intended to obscure the real peril that humanity is today exposed to: that is to say, the impasse that globalised capitalism is leading us into. In fact, it is this form of society — and it alone — which permits the destructive exploitation of natural resources, precisely because it connects this exploitation to the boundless quest for private profit. The fact that so many species are endangered, that climate change cannot be controlled, that water is becoming like some rare treasure, is all a by-product of the merciless competition among billionaire predators. There is no other reason for the fact that scientific innovation is subject to the question of what technologies can sell, in an anarchic selection mechanism. Environmentalist preaching does sometimes use persuasive descriptions of what is going on — despite the exaggerations typical of the prophet. But most of the time this becomes mere propaganda, useful for those states who want to show their friendly face. Just as it is for the multinationals who would have us believe — to the greater benefit of their balance sheets — in the noble, fraternal, natural purity of the commodities they are trafficking. The fetishism of technology, and the unbroken series of "revolutions" in this domain — of which the "digital revolution" is the most in vogue — has constantly spread the beliefs both that this will take us to the paradise of a world without work — with robots to serve us, and us left to idle — and then, on the other hand, that digital "thought" will crush the human intellect. Today there is not one magazine that does not inform its astonished readers of the imminent "victory" of artificial over natural intelligence. But in most cases neither "nature" nor the "artificial" are properly or clearly defined. Since the origins of philosophy, the question of the real scope of the word "nature" has been constantly posed. "Nature" could mean the romantic reverie of evening sunsets, the atomic materialism of Lucretius (De natura rerum), the inner being of things, Spinoza’s Totality (Deus sive Natura), the objective underside of all culture, rural and peasant surroundings as counterposed to the suspicious artificiality of the towns ("the earth does not lie," as Marshal Pétain put it), biology as distinct from physics, cosmology as compared to the tiny location that is our planet, the invariance of centuries as compared to the frenzy of innovation, natural sexuality as compared to perversion… I am afraid that today "nature" most of all refers to the calm of the villa and the garden, the charm wild animals have for tourists, and the beach or the mountains where we can spend a nice summer. Who, then, can imagine man responsible for nature, when thus far he has just been a thinking flea on a secondary planet in an average solar system at the edge of one banal galaxy? Since its origins philosophy has also devoted a great deal of thought to Technology, or the Arts. The Greeks meditated on the dialectic of Techne and Physis — a dialectic within which they situated the human animal. They laid the ground for this animal to be seen as "a reed, the weakest of nature, but … a thinking reed." For Pascal, this meant that humanity was stronger than Nature and closer to God. A long time ago, they saw that the animal capable of mathematics would do great things to the order of materiality. Are these "robots" which they keep banging on about anything more than calculation in the form of a machine? Digits in motion? We know that they can count quicker than us, but it was we who invented them, precisely in order to fulfil this task. It would be stupid to look at a crane raising a concrete pillar up to some great height, use this to argue that man is incapable of the same feat, and then conclude by saying that some muscular, superhuman giant has emerged… Lightning-quick counting is not the sign of an insuperable "intelligence" either. Technological transhumanism plays the same old tune — an inexhaustible theme of horror and sci-fi movies — of the creator overwhelmed by his own creation. It does so either thrilled about the advent of the superman — something we have been expecting ever since Nietzsche — or fearing him and taking refuge under the skirt of Gaia, Mother Nature. Let’s put things in a bit more perspective. For four or five millennia, humanity has been organised by the triad of private property — which concentrates enormous wealth in the hands of very narrow oligarchies; the family, in which fortunes are transmitted via inheritance; and the state, which protects both property and the family by armed force. This triad defined our species’ Neolithic age, and we are still at this point — we could even say, now more than ever. Capitalism is the contemporary form of the Neolithic. Its enslavement of technology in the interests of competition, profit and concentrating capital only raises to their fullest extension the monstrous inequalities, the social absurdities, the murderous wars, and the damaging ideologies that have always accompanied the deployment of new technology under the reign of class hierarchy throughout history. We should be clear that technological inventions were the preliminary conditions of the arrival of the Neolithic age, and by no means its result. If we consider our species’ fate, we see that sedentary agriculture, the domestication of cattle and horses, pottery, bronze, metallic weapons, writing, nationalities, monumental architecture, and the monotheist religions are inventions at least as important as the airplane or the smartphone. Throughout history, whatever has been human has always, by definition, been artificial. If that had not existed, there would not have been Neolithic humanity — the humanity we know — but a permanent close proximity with animal life; something which did indeed exist, in the form of small nomadic groups, for around 200,000 years. A fearful and obscurantist primitivism has its roots in the fallacious concept of "primitive communism." Today we can see this cult of the ancient societies in which babies, men, women and the elderly supposedly lived in fraternity, without anything artificial, and indeed lived in common with the mice, the frogs, and the bears. Ultimately, all this is nothing but ridiculous reactionary propaganda. For everything suggests that the societies in question were extremely violent. After all, even their most basic survival needs were constantly under threat. To speak fearfully of the victory of the artificial over the nature, of robot over man, is today an untenable regression, something truly absurd. It is easy enough to answer such fears, such prophesies. For judged by this standard, even a simple axe, or a domesticated horse, not to mention a papyrus covered in symbols, is an exemplary case of the post- or trans-human. Even an abacus allows quicker calculation than the fingers of the human hand. Today we need neither a return to primitivism, or fear of the "ravages" the advent of technology might bring. Nor is there any use in morbid fascination for the science-fiction of all-conquering robots. The urgent task we face is the methodical search for a way out of the Neolithic order. This latter has lasted for millennia, valuing only competition and hierarchy and tolerating the poverty of billions of human beings. It must be surpassed at all cost. Except, that is, the cost of the high-tech wars so well known to the Neolithic age, in the lineage of the wars of 1914-1918 and 1939-1945, with their tens of millions of dead. And this time it could be a lot more. The problem is not technology, or nature. The problem is how to organise societies at a global scale. We need to posit that a non-Neolithic way of organising society is possible. This means no private ownership of that which ought to be held in common, namely the production of all the necessities of human life. It means no inherited power or concentration of wealth. No separate state to protect oligarchies. No hierarchical division of labour. No nations, and no closed and hostile identities. A collective organisation of everything that is in the collective interest. All this has a name, indeed a fine one: communism. Capitalism is but the final phase of the restrictions that the Neolithic form of society has imposed on human life. It is the final stage of the Neolithic. Humanity, that fine animal, must make one last push to break out of a condition in which 5,000 years of inventions served a handful of people. For almost two centuries — since Marx, anyway — we have known that we have to begin the new age. An age of technologies incredible for all of us, of tasks distributed equally among all of us, of the sharing of everything, and education that affirms the genius of all. May this new communism everywhere and on every question stand up against the morbid survival of capitalism. This capitalism, this seeming "modernity," represents a Neolithic world that has in fact been going on for five millennia. And that means that it is old — far too old.